Childhood is best time to get interested in solving puzzles. Brain Teasers and Puzzles will help a child to enhance his/her mental ability and brain power. Fun With Puzzles website contains many different puzzles of different categories ranging from Mathematical Puzzles, Logical Puzzles to Visual Observational skill puzzles. Many of these puzzles and brain teasers are specially created for kids and teens. 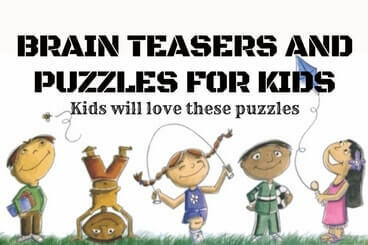 Here is the list of free puzzles which are easy and kids will love to solve these brain teasers. Missing Vowels Quiz-Can You Guess the Fruits? Find the Missing Number in These Triangles?